For those who don’t know precisely what smog is, it is a mix of emissions in certain climate conditions that include ozone, industrial and vehicle pollutants, open burning, and incinerators. Many urban and even suburban areas experience smog in one form or another, with the United States experiencing this more during summer while places like London see more during winter. New Delhi, India is currently in the middle of an especially high smog period, and it has led to considerable health challenges for its residents. With this form of air pollution being particularly hazardous during hot days, many cities issue smog warnings on such days. Noted health risks due to increased exposure to smog include coughing, fatigue, chest, nose, or throat irritation, worsening asthma symptoms, difficulty breathing, and damage to the lungs. Children, the elderly, and asthma patients are especially susceptible to the effects of smog. In terms of how individuals can protect themselves from smog, the EPA says most people only have to worry when ozone levels are high, specifically 150 or more on a scale of 300. Garlic and honey: Mix a little honey with garlic, which can allegedly help remove mucus caught in the lungs. Carrot juice: To help remove toxins and mucus from the lungs, you can try mixing in some cold-pressed coconut oil and black pepper with a glass of carrot juice. Pineapple extract: Also called Bromelain, pineapple extract is another component that can supposedly help clear up congested lungs. Flaxseed oil: Containing roughly 50 percent more Omega-3 than fish oil, flaxseed oil can also help improve overall health, containing Vitamin B, magnesium, potassium, zinc, and protein. Vitamin C-rich vegetables and fruits: Being naturally rich in antioxidants, Vitamin C-rich foods provide the lungs with their necessary dose of Vitamin C, making it essential to fill up on vegetables like bell peppers, kale, cabbage, and broccoli as well as fruits like gooseberries, strawberries, and watermelon. Vitamin E: Foods that are rich with Vitamin E, such as almonds, spinach, sweet potatoes, and avocados, are known for allegedly fighting free radicals in the body, something that would come in handy during high smog levels. 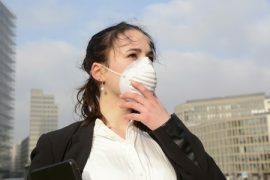 Because of the health risks inherent in smog exposure, it’s in the best interests of those who live in and around cities, especially those who are more vulnerable to its effects, to take heed of any warnings broadcasted by local news media as well as social media in order to protect themselves and their overall bodily health.